The Ministry of Communications and Transportation established the first two Pilot Training Schools in Sendai City in Miyagi Prefecture and Yonago City in Tottori Prefecture in 1938. These served as training facilities for pilots who would work in the Ministry of Communications and Transportation mainly to carry mail by plane. During the Pacific War, the Army and Navy increasingly used these Pilot Training Schools as sources for much needed trained pilots. The Army controlled the Sendai Pilot Training School. The Ministry of Communications and Transportation established a total of 13 Pilot Training Schools before the end of World War II. During the Pacific War, the Army had ten of these schools, and the Navy directed the other three. From the 13 Ministry of Communications and Transportation Pilot Training Schools, there were a total of 3,200 men who graduated, received supplemental flight training at Army and Navy training bases, and became noncommissioned officers. As Japan's situation worsened toward the end of the war, 162 graduates from Pilot Training Schools died in special (suicide) attacks. Mutsu Kokubun Niji, a Buddhist temple in Sendai City near Yakushidō Station, has the Sendai Pilot Training School Monument near its entrance. The monument's face has engraved "Air Monument," and the back has the following engraved words that have faded to the point where they are barely readable. Among the 1,022 men who trained at this school, 210 lost their lives in battle during World War II. Remembering their heroic deeds, we offer this heartfelt memorial tribute. We pray for world peace and that they may have happiness in the next world. Sergeant Saburō Miyagawa, who spent time at Sendai Pilot Training School, died after taking off in a special attack squadron from Chiran Air Base on June 6, 1945. His supposed return to Chiran as a firefly became a well-known story that was the source of the title for the 2001 Japanese film Hotaru (Firefly). 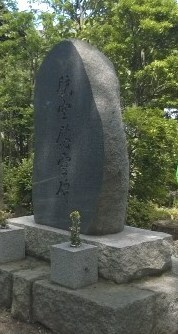 Tokkōtai Senbotsusha Irei Heiwa Kinen Kyōkai (Tokkōtai Commemoration Peace Memorial Association). 1990. Tokubetsu Kōgekitai (Special Attack Corps). Tokyo: Tokkōtai Senbotsusha Irei Heiwa Kinen Kyōkai.